I therefore was able to transcribe the lyrics of the five migra corridos that are currently being played in Mexico and were produced as a CD by the U.S. Customs Border Protection Agency as part of their campaign entitled “Border Safety Initiative” in 2008. According to several newspaper reports (“Migra Corridos’ aim;” Otey; Rozemberg; Surdin; Wojcik), the CD was paid for by the Homeland Security Agency to spread fear about crossing the U.S.-Mexico border undocumented or, as they prefer to call it, “illegally,” and thus stem the flow of Mexican immigration. The various agencies involved promote the official line that the songs are designed to be musical deterrents to prevent deaths at the border. 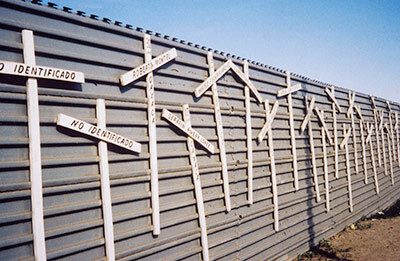 Indeed the “Border Safety Initiative” is denominated as “No Más Cruces en la Frontera,” a phrase that can be translated as both “No more crossings at the border” and “No more crosses at the border.” The latter phrase, “No more crosses,” refers to the wooden crosses often placed in the general area where an immigrant or immigrants have perished during their futile attempt to enter the United Stated. This linguistic border-crossing in itself is interesting and can provide further material for “border-crossing” discussions. Posters depicting Mexican migrants with the shadow of death ever present are also part of the campaign cited above as the “Border Safety Initiative” (“Migra Corridos’ aim” 1). However, the central focus of this essay is to explore and expand theoretical paradigms related to the concept of adaptation as it relates to the appropriation of the corrido genre by the Border Patrol. This type of genre adaptation is for the express purpose of disseminating propaganda by the U.S. government in its ongoing attempt to stop Mexican migratory movements. When I began the present article on migra corridos, I assumed that critical theories related to adaptation studies would be useful for my work and aid me in shedding light on government entities adapting literary genres for political and propagandistic objectives. In fact, I was disappointed not to find much theoretical work relevant to my endeavor. Linda Hutcheon’s study, A Theory of Adaptation (2006), proved to be an outstanding source for critical theories involving literary adaptations. Hutcheon’s book, however, is a defense of the transposition of one literary genre to another such as novels to films, whose negative perception she critiques. She expounds: “Yet, as we shall see, disparaging opinions on adaptation as a secondary mode—belated and therefore derivative—persist. One aim of this book is to challenge that denigration” (xiii). Hutcheon cites a series of negative words associated with adaptation such as: belated, middlebrow, culturally inferior, tampering, interference, violation, betrayal, deformation, perversion, infidelity, and desecration. My essay, on the other hand, basically agrees with the above pejorative terms when applied to the adaptation of the Mexican ballad genre as an anti-immigrant initiative—not necessarily because one genre is adapted into another form but because of the covert, underhanded, and conspiratorial nature of the activity. Thus, in a sense, I agree with Hutcheon’s position that adaptations are not negative per se. However, in the case of the migra corridos produced by the U.S. government agencies, the adaptations done can be perceived in negative terms due to the lack of transparency and to the intent to deceive people. I posit in this essay that the Border Patrol is engaged in deceitful adaptation activities with the production, publication, and dissemination of their migra corridos. My research intends to expand the parameters of the conversation vis-à-vis adaptation studies. In her book Hutcheon provides us with an excellent three-point definition for the concept of adaptation: 1) an acknowledged transposition of a recognizable other work or works, 2) a creative and an interpretive act of appropriation/salvaging, and 3) an extended intertextual engagement with the adapted work (8). Hutcheon conceptualizes adaptation as being composed of two vectors: process and product. That is, the process of adapting one literary work into another and the product of this adaptation. Hutcheon’s seminal study focuses on literary texts but does not theorize with respect to extra-literary forms of adaptation such as the Border Patrol’s adaptation of a literary genre for propagandistic purposes. Given the above study and its lack of focus on extra-literary adaptations, I argue that an analysis and theorizing of this new subgenre of migra corridos and their adaptation to a covert government operation offers an excellent case study for structuring theories within contemporary adaptation/appropriation studies. This extra-literary adaptation of a literary genre by a government entity is alarming, since it is yet another form of government intervention and manipulation for its own political ends. It is particularly troubling that a government underhandedly appropriates a literary cultural tradition from a community and tries in this manner to manipulate its decision-making process via this form of deceit. Various newspaper articles as well as some bloggers expressed this view (“Migra Corridos’ aim;” “Migra Corridos to keep;” Monoclonius; Otey; Rozemberg; Surdin; Wojcik). Migra corridos can be thought of as a contemporary manifestation and subgenre of Mexican ballads. Another subgenre of the corrido that surfaced in the 1960s and became very popular in subsequent decades, for example, is the narcocorridos, or drug smuggling-themed ballad. The corrido has a long history of being a politically involved genre from its early inception. According to Américo Paredes, it “crystallized” as a living tradition out of the clash of cultures and cultural conflict along the U.S.-Mexico border between Mexicans and Anglos in the middle of the nineteenth century (Paredes). A succinct definition of the genre is that it is a musical composition that tells or narrates a story. Corridos have been the voice of the Mexican and Mexican American people narrating their history, love stories, and tragedies; the exploits of famous bandits, deeds of revolutionary heroes and heroines, and any other newsworthy event. Troubadours sang their songs on street corners, selling the texts of the performed musical composition in printed form as broadsides or flyers. Their content frequently encompassed a political purpose, since they tended to be subversive as well as informative, providing historical narratives for the community who lacked the venues of established newspapers or printing presses. These folksongs are part and parcel of the Mexican and Mexican American oral tradition and heritage (Chew-Sánchez; de la Garza; Herrera-Sobek, Bracero Experience and Northward Bound; Paredes). As might be expected, the topic of Mexican immigration to the United States encompasses a large and important number of texts within the corpus of the corrido tradition, and the history of Mexican migratory movements can be traced via these texts (Chew-Sánchez; de la Garza; Herrera-Sobek, Bracero Experience and Northward Bound; Paredes). A cursory examination of the history of the word “migra” and its appearance in Mexican corridos will illuminate the historical trajectory of the term and related words. I crossed to this side [to the U.S.A.] without paying the immigration [fee]. The reference is to the eight-dollar fee that had been initiated by the 1917 Immigration Act. This was the first immigration act passed by the U.S. Congress related to the border between the U.S.A. and Mexico and it was due, in part, to the fear of Germans that might try to attack the United States by crossing the U.S.-Mexico border. Since workers were needed during the World War I era, the fee was mostly waived or customs officials were lax in enforcing its payment (Cardoso 18; Herrera-Sobek, Northward Bound 37). Thus the immigrant in the above song laughs at not having paid the eight-dollar fee. This early corrido is a forerunner of many satirical ones, which poke fun at the Border Patrol and its agents and brag about the immigrant’s cleverness in avoiding and/or outsmarting them. Nevertheless, in spite of the jocularity of the above song, the migra will thereafter become a powerful opponent facing the immigrant at every turn. This clash between immigrant and Border Patrol will eventually become a cat and mouse game that will turn deadly in the 1950s and thereafter—particularly since the late twentieth century. The song is also indicative of the manner in which laws on immigration will be viewed thereafter. Since the Mexican immigrant was/is a highly desirable worker, immigration officers tended to look the other way when the harvest season was in full swing in U.S. agricultural fields and became more strict after the harvesting of crops was over. This was clearly evident to the migrant workers and laid the foundation for the disrespect with which immigration laws have been viewed ever since their introduction by Congress in 1917 and up until the present (Cardoso 18; Herrera-Sobek, Northward Bound 37). so you can cross illegally. the fee is sixteen pesos. The Immigration Act of 1917 was not really directed at keeping Mexicans out, as stated earlier, but stemmed from the fear of German saboteurs crossing the border through Mexico during World War I as well as aimed at prohibiting immigration from Asia. Various subsequent immigration legislative acts continued to not exclude Mexicans from their purview such as the 1924 Immigration Quota Act. Therefore, Mexicans actually entered and left the United States rather freely—the border in fact was an open border, given the great need for Mexican labor required to develop the Southwest’s infrastructure as well as the scarcity of workers during World War I and the industrial, agricultural, and commercial boom years of the expanding 1920s (National Archives). Keeping statistics on alien arrivals at U.S. land borders was not required by early immigration acts. Thus, statistical treatment of Canadian and Mexican border immigrants at times has differed from that of other immigrants. When records of arrivals began to be kept at the Canadian border in 1895 and at the Mexican border around 1906, the immigration authorities found it impractical to collect arrival information on lists as they did for ship passengers (National Archives). when it was least expected. Later it was not until the 1960s that corridos again appear with the word “inmigración” for immigration officers within their lyrics. The reason for this renewed interest in highlighting the border conflict was the end of the 1942 U.S. and Mexican Government Agreement (popularly known as the Bracero Program) in 1964, as a consequence of which undocumented immigration increased by leaps and bounds. Workers, especially farm workers, were still greatly needed in the U.S.A., and the Bracero Program had led the way in teaching Mexicans about the United States and the employment opportunities awaiting them there. The various economic downturns in Mexico also led to increased undocumented immigration to the United States, since there was no longer an easy method of entering the country legally. Various immigration legislative acts had been instituted that presented quotas for Mexicans and led to tremendously long waiting periods in order to be able to acquire legal documents for resident status (Spiegel and McCarthy). for the sake of evil money. Superman is an illegal alien. In subsequent immigrant-themed songs from the 1990 and the 2000s the word “migra” continues to be used in the lyrics. However, the migra corridos explored in this study differ quite markedly from the typical Mexican or Mexican American corrido texts. The president of Elevación, Jimmy Learned, told BBC Mundo in an interview that he distributed the CD to radio stations in Mexico, especially targeting the states that are generally recognized as “sending states,” that is, those states from which historically the highest number of immigrants has come to the United States. Most significantly, Learned admitted that his advertising company purposely did not inform the Mexican radio stations’ personnel regarding the agency that had commissioned the corridos and paid for their production: “A lot of people thought the Mexican government was behind it—the last thing we wanted was to put paid by La Migra […] What’s most important is that if we’ve made people think twice, we’ve succeeded” (qtd. in “Migra Corridos’ aim”). Some of the disc jockeys and radio station managers in Mexico, where the CD was distributed, expressed concern when they found out that the U.S. Border Patrol had been involved in financing and commissioning the corridos. One of them, José Gasca from the state of Michoacán, told Associated Press that if people knew, “they’d feel as if La Migra was after them in their own country” (qtd. in “Migra Corridos’ aim”). Others felt that it was a humanitarian act to try to prevent the death of immigrants on their way across the border (Surdin E1), echoing Jimmy Learned’s words. The audience response to the ballads, according to various reports in online newspaper articles, seemed to have been positive. The migra corridos were first played by Mexican radio stations in snippets, but soon listeners wanted to hear the entire songs and know the name of the singer as well as the group playing. The Border Patrol, on the other hand, is bragging about the success of the commissioned CD. Wendi Lee, a Border Patrol spokesperson, informed Associated Press that “border crossing deaths [had] declined from a record 492 in 2005 to 390 last year” (qtd. in “Migra Corridos’ aim”). Critics of the Border Patrol’s propaganda point out that other factors may have been responsible for the decrease in migrant crossings and deaths such as the downturn in the economy, the beefed-up border as well as the 700 mile fence being built (“Migra Corridos’ aim”). 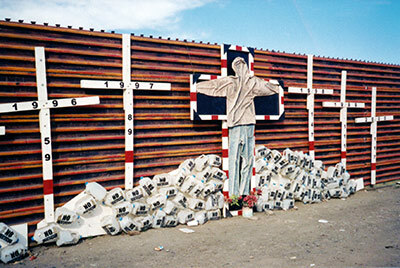 U.S.-Mexico Border Fence (Mexican Side). Photos by Francisco A. Lomelí. The five corrido texts that I have collected—“El Respeto” [“Respect”], “Veinte” [“Twenty”], “El Más Grande Enemigo” [“The Biggest Enemy”], “En la Raya” [“On the Borderline”], and “Esperanza Perdida” [“Lost Hope”]—in fact do not follow the classical corrido structure as outlined by corrido scholars (see Paredes). They neither feature the classical introduction by the corrido singer as well as the date and place of the action nor the “despedida” or farewell. What they do include is a linear, chronologically ordered narrative of immigrants crossing the border. The stanzas also vary from the more traditional four-line to a six-line stanza. Some of the compositions exhibit rhymed strophes while others do not. They also do not display the usual ABCB rhyme scheme in the stanzas. These aspects suggest that the writers of these songs were rather inexperienced with respect to the classical structure of the corrido. I put my life on the line. that it was a trip to hell. now that their son is dead. que vaga por el desierto. that he wanders in the desert. and facing him is an uncertain future. Porque más vale vivo que muerto. also manly to give up. Because it is better to live than to die. No more crosses on the border. as if he could foresee something. He looked like a lost soul. pensó en buscar el regreso. como quien pierde por fin la batalla. pa’ que su pena no pase en vano. like one who has finally lost the battle. so that his suffering was not in vain. And there will be no more crosses at the border. It is interesting to note that the word “migra” does not appear in the Migra Corridos collection. In fact, the Border Patrol as a protagonist is common in corridos and popular songs. At times the “migra” appears as a heartless entity that mistreats the immigrant such as in “Deportados” and the above-cited “Corrido de la Emigración.” Most of these corridos date from the deportation and repatriation era. At other times, the “migra” is made fun of as in such songs as “Los Mandados” [The Errands]. In this case the immigrant brags how he is not afraid of the Border Patrol since they are his “errand boys” (Herrera-Sobek, Northward Bound). In reformulating Linda Hutcheon’s theoretical construct of adaptation, which she conceptualized as a dyad composed of process and product, I submit two more vectors that need to be incorporated in her construct. These are use and intentionality. When adapting a literary text, two important questions to ask are: What is the intention for adapting or appropriating this text, and what final use will the adaptation have? Hutcheon does articulate her concern for a new revision of intentionality, but due to the negative baggage intentionality currently carries, she acknowledges her reluctance to explore this topic to its fullest (for a full discussion on the issues related to literary intentionality see Hutcheon 106–09). Nevertheless, adaptation of literary forms needs to be conceptualized from the point of view of extra-literary adaptations such as those done for purposes of political propaganda and advertising, to name but a few. One can see the use of the corrido for political propaganda in the hands of the Border Patrol, and while the United States are a democratic country and the Border Patrol is free to use literary works as it sees fit, there are ethical questions to answer at least. Moreover, the public needs to be alert with respect to how a government uses propaganda for its political objectives. There are numerous examples of adaptations of literary texts and motifs for extra-literary objectives such as the use of the Mexican mythical figure of La Llorona, or Weeping Woman, for selling products such as milk, coffee, and Verizon internet services in Southern California. Critical theories are cognitive maps that guide us in the apprehension and hermeneutics of our world. As humanity continues to be bombarded by ever-expanding media, it is imperative that we have our critical skills, our critical antennas sharpened in order to detect Trojan horses concealed in our daily lives. The Border Patrol concealed such a Trojan horse within what appears to be for many Mexicans and Mexican Americans the safe and familiar space of the corrido lyrics. It is a readily recognizable form within a beloved oral tradition. Thus the Border Patrol’s demonstrates its cleverness in its appropriation and adaptation of the genre. Nevertheless, as the old saying goes, “you can fool some of the people some of the time but you cannot fool all of the people all of the time.” The Border Patrol has been caught in a very cynical, underhanded covert operation. Balderrama, Francisco, and Raymond Rodríguez. Decade of Betrayal: Mexican Repatriation in the 1930s. Albuquerque: University of New Mexico Press, 1995. Cardoso, Lawrence A. “Labor Emigration to the Southwest, 1916–1920: Mexican Attitudes and Policy.” Mexican Workers in the United States: Historical and Political Perspectives. Eds. George C. Kiser and Martha Wood Kiser. Albuquerque: University of New Mexico Press, 1979. 16–32. Chew-Sánchez, Martha. I. Corridos in Migrant Memory. Albuquerque: University of New Mexico Press, 2006.
de la Garza, María Luisa. Ni aquí, ni allá: El emigrante en los corridos y en otras canciones populares. Cádiz: Ayuntamiento de Cádiz, 2005. Herrera-Sobek, María. Northward Bound: The Mexican Immigrant Experience in Ballad and Song. Bloomington: Indiana University Press, 1993. —. The Bracero Experience: Elitelore Versus Folklore. Los Angeles: UCLA Latin American Center Publications, 1979. Hoffman, Abraham. Unwanted Mexican Americans in the Great Depression: Repatriation Pressures, 1929–1939. Tucson: University of Arizona Press, 1974. Hutcheon, Linda. A Theory of Adaptation. Oxon and New York: Routledge, 2006. Iglesias-Prieto, Norma. “Trascendiendo límites: La frontera México-Estados Unidos en el cine.” FIAR: Forum for Inter-American Research 3.2 (2010). 13 May 2012 <http://www.interamericaonline.org/index.php?option =com_content&view =article&id =76:volume32iglesias&catid =22:vol-3-no-2&Itemid=36&lang=en>. Maciel, David R. El bandolero, el pocho y la raza: Imágenes cinematográficas del Chicano. Trans. Patricia Reyes Baca. Mexico City: Siglo Veintiuno, 2000. Migra Corridos. Elevación, 2008. CD. “‘Migra corridos’ aim to keep immigrants home.” New York Daily News. 22 Jan. 2009. 24 Nov. 2010 <http://www.nydailynews.com/latino/2009/01/23/2009-01-23_migra_corridos_aim_to_keep_immigrants_ho.htm>. “‘Migra corridos’ to keep …” New York Daily News: Discussions. 16 Mar. 2009. 24 Nov. 2010 <http://www.nydailynews.com/forums/thread.jspa?threadID=53494>. Monoclonius, D. S. “Migra Corridos.”Unsullied and Undismayed: Some Comments on the State of Things Courtesy of the Colonel. 4 Feb. 2009. 12 Apr. 2011 <http://undismayed.blogspot.com/2009/02/migra-corridos-friend-of-mine-just-told.html>. National Archives. Mexican Border Crossing Records. 4 Apr. 2011. <http://www.archives.gov/research/immigration/border-mexico.html>. Orrenius, Pia M. “Illegal Immigration and Enforcement along the Southwest Border.” The Border Economy. Ed. Federal Reserve Bank of Dallas. June 2001. 13 May 2012 <http://www.dallasfed.org/assets/documents/research/border/tbe_orrenius.pdf>. Otey, Jim. “Homeland Security Says It With Song.” Pollstar: The Concert Hotwire. 7 May 2009. 24 Nov. 2010 <http://www.pollstar.com/blogs/news/archive/2009/05/07/666208.aspx>. Paredes, Américo. “With a Pistol in His Hand:” A Border Ballad and Its Hero. Austin: University of Texas Press, 1958. Rozemberg, Hernán. “Melodies with a Message Target Would-Be Immigrants.” San Antonio Express-News. 16 Jan. 2009. 24 Nov. 2010 <http://www.trinity.edu/dspener/clandestinecrossings/photos/bp-corridos/bp-corridos-article.pdf>. Spiegel, Julia, and Ed McCarthy. “Immigration and History Workshop.” Yale Law School, 2011. 17 Apr. 2011 <http://www.law.yale.edu/documents/pdf/Clinics/Immigration_History_Timeline.doc>. Surdin, Ashley. “Crossover Appeal: South of the Border, Popular Ballads about the Perils of Illegal Immigration Have a Surprising Heritage: Made in—and by—the United States of America.” Washington Post 15 Mar. 2009: E1. Wojcik, Theodore J. “The ‘Talented’ U.S. Border Patrol: Musical Propaganda.” Dartmouth Free Press. 27 Feb. 2009. 24 Nov. 2010 <http://www.dartmouthfreepress.com/2009/02>. 1 The following websites play one or more of the migra corridos: Maria Hinojosa, Latino USA, <http://latinousa.kut.org/2009/02/20/2151/>, and Ashley Surdin, “Crossover Appeal: Border Patrol Uses Music to Cross a Cultural Line,” Washington Post 15 March 2009. <http://www.washingtonpost.com/wp-dyn/content/article/2009/03/13/AR2009031304234.html> (both accessed 10 Oct. 2010). 2 In my analysis of Mexican immigrant corridos (Herrera-Sobek, Northward Bound), I have found that the corridos frequently interchange the words “inmigración” and “emigración” for immigration officers or the Border Patrol. 3 See Herrera-Sobek, Northward Bound. In addition to corridos there is a whole genre of Mexican films that depict the dangers of the journey to the United States. Films such as Espaldas Mojadas [Wetbacks] (1953), La Ilegal [The Illegal Woman] (1980), El Norte [The North] (1990), and many others portray the journey north as perilous and often leading to death (Iglesias-Prieto; Maciel). Nevertheless, for the immigrant, the necessity of finding work and a better life in the United States is much stronger than the fear of death. María Herrera-Sobek is Associate Vice Chancellor for Diversity, Equity and Academic Policy, and holds a Professorship in Chicana/o Studies at the University of California, Santa Barbara. She received her Ph.D. in Hispanic Languages and Literature from UCLA. Past appointments include professorships and visiting professorships at the University of California at Irvine, Harvard University, and Stanford University. She has published over 150 articles and 16 books, including The Mexican Corrido: A Feminist Analysis (Bloomington, IN, 1990), Northward Bound: The Mexican Immigrant Experience in Ballad and Song (Bloomington, IN, 1993), and Chicano Folklore: A Handbook (Westport, CT, 2006). Herrera-Sobek is Associate Editor of the Norton Anthology of Latino Literature (New York, 2010) and is presently working on the Encyclopedia of Latino Folklore. Herrera-Sobek, María. “The Border Patrol and Their Migra Corridos: Propaganda, Genre Adaptation, and Mexican Immigration.” American Studies Journal 57 (2012). Web. 24 Apr. 2019. DOI 10.18422/57-06.